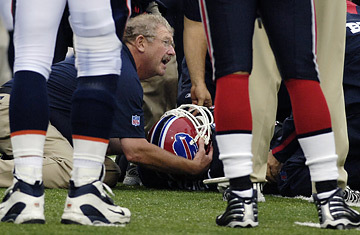 A trainer, center, helps Buffalo Bills' Kevin Everett after he was injured. The life threatening spinal-cord injury that Buffalo Bills tight end Kevin Everett suffered on Sunday while trying to make a tackle adds urgency to a question that gnaws at the NFL with each passing season  is playing pro football worth the risks? Everett, 25, remains sedated and on a respirator at Millard Fillmore Gates Hospital in Buffalo following surgery to relieve the pressure on his spine. His orthopedic surgeon, Dr. Andrew Cappucino, had said Everett's chances of walking again are "bleak or dismal." However, after Everett voluntarily moved his arms and legs on Tuesday, Cappuccino reportedly told a Buffalo TV station "we may be witnessing a minor miracle." It's only the first week of the season, but already the list of injured players is growing. Both New York quarterbacks  Eli Manning of the Giants and Chad Pennington of the Jets  may miss games because of shoulder and ankle injuries, respectively. Orlando Pace, the all-pro offensive lineman from the St. Louis Rams, tore the labrum and rotator cuff in his right shoulder. He will miss the season. A steady stream of injuries marred Cincinnati's thrilling 27-20 win over the Baltimore Ravens Monday night: about a dozen Ravens visited the team doctor Tuesday morning for treatment. None, however, compare to Everett's tragic injury. The third-year Bill suffered a fracture and disclocation of his spine, in which the C3 and C4 vertebrae in his spinal cord were telescoped when he went in to tackle the Broncos' Domenik Hixon on a kickoff return. Everett's helmeted head made contact with the hard plastic of Hixon's shoulder pad, and he immediately dropped to the ground, his spinal cord shocked by the impact. "He had a compressive load to his spine, and the spine doesn't handle those kinds of loads very well," says Dr. Joseph Kowalski, director of the Spine Center at Erie County Medical Center, and an orthopedic specialist who has spoken with Everett's doctors. "This caused the vertebrae to separate and fracture." Of immediate concern with such a trauma are the ABCs  airway, breathing and circulation. Because the nerves that control breathing are located in the C3-4 area of the spine, doctors on the field and in the emergency room were initially focused on making sure that Everett's breathing and blood pressure were maintained. Kowalski notes that in the hours following his injury, Everett did have some sensation in his legs, although he could not move them. That could be an encouraging sign, but spine experts have seen enough spinal cord injuries to know that every case is different, and early response is not always a good indicator of later recovery. Everett may have damaged his spine in the way he dove in for his tackle, with a move known as spearing, in which a player contacts his opponent head first. Because the head and spine are aligned, in this position the spine tends to bear the brunt of the blow, which is why the National Collegiate Athletic Association banned spear tackling in 1976. Beginning in grade school, players are now taught to keep their head up during a tackle, and a sign reminding players to "SEE WHAT YOU HIT!" hangs in every NFL locker room. "I played 20 years ago in high school, and my coaches really pounded home the need for good form, to keep the head up to maintain the curvature of the head and spine to dissipate any forces from impact," says Dr. Andrew Sama, spinal surgeon at the Hospital for Special Surgery in New York City. "But everything happens so fast on the field, all it takes is a tiny change in head position to get you in trouble ." It doesn't help that today's players are also bigger, faster and stronger, which means that each impact packs more punch. Since 1985, the average weight of NFL players has ballooned 10%, to 248 pounds, according to a recent study by Scripps Howard News Service. The heaviest position, offensive tackle, has gone from 281 pounds two decades ago to 318 pounds today. So, the dozens of high-speed hits that happen every game carry a higher likelihood of potentially hazardous results. While catastrophic injuries like Everett's remain rare, reports of concussions and other severe trauma on the football field are starting to pile up even at the high school and college level. In a study of high school and college football players published last summer, the American Orthopedic Society for Sports Medicine found that between 1989 and 2002, on average of six players per year became quadriplegic after an injury on the field. Even more alarming was the cause of these catastrophic injuries  spear tackling. "Especially on a kickoff or punt return, the whole purpose is to just collide with your opponent, to take somebody out," notes Sama. "And when you have athletes at the top of their game going full force, unfortunately these things happen." Is better equipment the answer? Yes and no. Responding to the growing concern over concussions on the field, helmet manufacturers have added aid bladders to cushion the head as well as support to the cheek, jaw and facemask areas. But nothing has yet been developed that can protect the spine, especially during a spear tackle. "The newer helmets are not going to significantly change the stress the neck sees as a result of a top-of-the-head blow," Andrew Tucker, team doctor for the Baltimore Ravens, says. "Right now, the prevention of these types of injuries lies in proper tackling technique. That's much more important than anything we can do on the equipment side." Under pressure by current and retired NFL players, many of them suffering from disabilities for which they are demanding benefits, the NFL is also addressing the worrying rise in concussions. For the first time, all players were required to take neuropsychological tests by the start of the 2007 season. Doctors can then use these results to establish a baseline of cognitive abilities, memory and motor skills against which they can compare scores after a head injury. The league also added a concussion hotline that players can anonymously call if coaches are forcing them to play against medical advice. Such measures won't prevent catastrophic injuries on the gridiron, but they may help to keep them to a minimum.